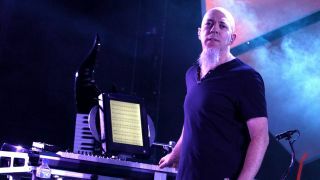 Dream Theater keyboard wiz Jordan Rudess has already released a virtual truckload of groundbreaking music-making apps, and now he's put out a couple more for Windows 7 and Windows 8. Going by the names of ShapeSonix and Maestro, both of these are free and available now. Released through Rudess's company, Wizdom Music, ShapeSonix allows users to create their own visual and audio reality and to compose customizable multimedia soundscapes. The user chooses a preset and either clicks on the screen or moves their fingers on their multi-touch device to create particles. The moment of impact between particles and shapes will be met with an assortment of beautiful sounds from Wizdom Music's extensive library. The beauty of ShapeSonix is that it can be as interactive as the user wants. Since particles can also be self generated by an in-app chaos controller, and a particle emitter, active playing is not necessary. Users can also roll the dice on the main page and allow ShapeSonix to change everything randomly for them. From musical beginners to advanced sound designers, there is an entire world here to discover with ShapeSonix. Also via Wizdom Music comes Maestro. Through the use of advanced camera technology and gesture recognition, Maestro allows you to lead an orchestra through the world's favorite classical masterpieces. Your musicians are a group of three-dimensional characters, whose appearances and instruments you choose. These guys know what they're doing, so even if you're conducting is a little shaky at first, your attentive orchestra will follow your lead. In order to conduct, move your hand in a horizontal motion from one side of your camera to the other at about arm's length away. As soon as your movement has been recognized, a processed image of your hand, an onscreen beat counter, and clear RED indicators will be shown on the screen. All you have to do is give your orchestra afour count, and then they will start playing! For those that are "camera shy," or don't have a camera, don't worry. Maestro also has a feature that allows you to simply tap the beat. Regardless of your conducting methods, your skilled musicians will become visually illuminated when they are busy playing their part, and the screen graphics will pulse to your song. So jump in and try your hand to see if you have what it takes to conduct an orchestra. Let the music begin! Rudess explains, "I worked with chief programmer Tobias Miller to create ShapeSonix and bring it to the Intel AppUp center We wanted to create something visually beautiful and at the same time, sonically very engaging and unique. The merging of the audio and visual world is one that Wizdom Music is very involved with. ShapeSonix is the natural progression to our previous releases." Regarding Maestro, Rudess notes, "Maestro features a very cool group of on screen 3D musicians that follow your every move...Our goal was to create something really fun and interactive by allowing users to interact with their own web cams to conduct the orchestra. It's a lighthearted application which was coded by Kevin Chartier and features select classical repertoire arranged specifically for Maestro by Eren Basbug." You can download ShapeSonix right here, and click here to download Maestro.